Disclosure: This compensated post is part of the #CollectiveBias #GladeForFall promotion. All opinions stated are solely mine. It’s no secret that the last three months of the year are my most favorite season. The long, hot Summer is finally on the way out in Texas -- and cool(er) temperatures are here! Sundays are all about football, and my thoughts turn to Fall flavors in my cooking. I love to set the Fall mood by enjoying Glade® seasonal scents in my home too! The Glade® Limited Edition Fall Collection is featuring two amazing scents that immediately evoke visions of Fall in my mind: Pumpkin Pit Stop™ and Hit the Road™. Both scents immediately transport me on a journey in my mind to experience the perfect Fall day – even if afternoons in Texas are still a bit warm! I found these Glade® Limited Edition Fall Collection items -- including wax melts, candles, and room spray -- on a special display at my local Kroger. Because it was in the middle of a wide aisle, it was easy to find! I love to use scents to inspire me to create fun seasonal recipes in my kitchen. From the moment I smelled Pumpkin Pit Stop™ wax melts warming in my living room, I decided that I wanted to create a decadent pumpkin dessert -- but I wanted it to be easy and stress free! Pumpkin Pit Stop™ features notes of orchard blossoms and meadow grass that give way to the mouthwatering scent of sweet cream frosting and whipped vanilla. This scent inspired me to go in the kitchen to create my Pumpkin Spice Bundt with Maple-Pecan Glaze. This cake is a snap to make, because it starts with a convenient box cake mix. If you love pecan and maple, the glaze that tops this cake is perfect for you. Put it all together, and this bundt is the perfect cake for Fall. Step 1: Preheat oven to 350 and generously butter and flour the pan. Add the cake mix, eggs, oil, creamer, pumpkin, pudding mix, and cinnamon to the bowl of a stand mixer. Mix on low speed for 30 seconds. Scrape down the sides of the bowl and mix on medium speed for 2 minutes. Step 2: Carefully spoon the batter evenly into the prepared pan. Tap on the counter to remove any air bubbles and place on a cookie sheet in the oven. Bake for 50-55 minutes, rotating the pan halfway through baking. Test with a wooden skewer; the cake is done when the skewer comes out clean. Cool the cake in the pan for 10 minutes, then flip the cake onto a cooling rack to finish cooling. Step 3: While the cake cools, make the glaze. Add the butter and maple syrup to a microwave-safe measuring cup. Microwave for 2 minutes, until the mixture reaches a full rolling boil. Remove from the microwave and add the coffee creamer. Whisk well to combine and add the powdered sugar. Whisk until smooth. Let the glaze cool for 10 minutes, then pour it over the cake. Top the cake with the chopped pecans and cut into thick slices. 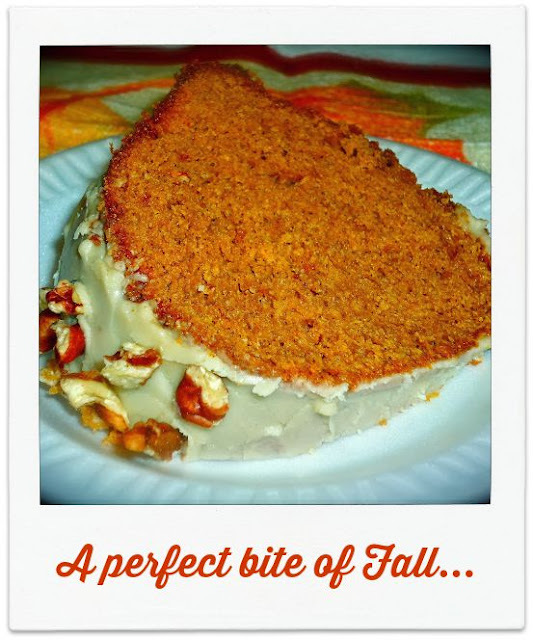 This cake is indeed a perfect bite of Fall! It’s rich and moist, with a nice flavor combination of earthy pumpkin, warm spices, and maple. This comforting cake makes a nice Fall dessert with a cup of warm tea or coffee -- but we also enjoy slices with a big glass of milk for a decadent breakfast too! I hope you’ll give my pumpkin-infused bundt cake a try this Fall – it’s easy to make and downright addictive! To set the Fall mood even more, be sure to try one of these two feature items from the Glade® Limited Edition Fall Collection! Leave me a comment below letting me know which scent you would select – and how you would use it to inspire your Fall adventures!